Orange_6_12_x_6_12_Square_Envelopes is rated 2.0 out of 5 by 1. Rated 2 out of 5 by Anonymous from Good envelopes, bad pricing and service I bought 20 of these in copper, 6.5 square and while the product itself is fine, I found a much better deal (pack of 50 for less than the cost of the 20 at JAM) afterwards. I cancelled my order within minutes of placing it, but they shipped it out to me anyways. It wasn't worth the money to have to reship it back. Will definitely be shopping at the other store in the future. We bet you that we can make a better joke than Carrot Top himself! There you go, we did it. Carrot Top's carrot top has nothing on these square envelopes! First, they come in many different orange shades and Carrot Top only has ... one. Second, these envelopes will definitely get you on the road to success and you will actually stay there! We’re just kidding Carrot Top, but did you have a roast yet? Use these envelopes as props for your next comedy sketch (if you work them in the sketch, we will applaud you completely). Or just use them as the invitation to your next stand-up comedy show! 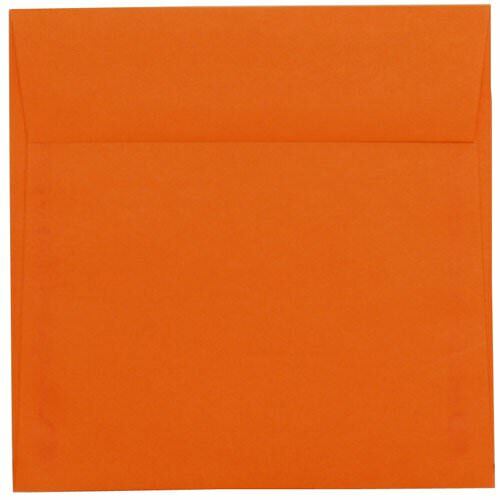 Choose these orange envelopes to make your invites pop just like Scott Thompson's own hair! Yes, that's his real name. We agree with his decision on changing it. If not, where would this description be? Orange 6.5 x 6.5 Square Envelopes at JAM Paper & Envelope are available in Mandarin Orange, Dark Orange, Translucent Orange, & Copper Metallic.